The Candy Store started with two automobile enthusiasts in1979 with Bob Cole and the late Russell Head. Their vision was to have a safe environment to store their collection, and yet have a clubhouse to share the visual feast and camaraderie with other enthusiasts. 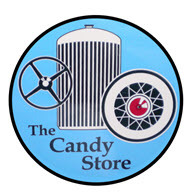 In 1983, The Candy Store organized into a not-for-profit club, and the members and their cars relocated to our current facility. The elegant Spanish style building was designed in 1928 as a Packard Dealership for Earl C. Anthony.